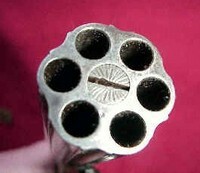 Did I say that the Colt Patterson was the first revolver? Well, it was the first Colt revolver, anyway. There had been earlier multishot pistols, called Pepperboxes, but they were built so that each bullet had its own barrel, so they weren't revolvers. This is an example of a pepperbox. Multiple barrels made them fairly heavy. An improvement was a flintlock revolver, which had multiple firing chambers, but only one barrel. 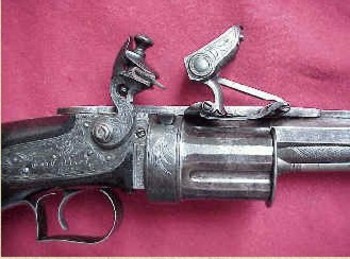 Elisha Collier made an effective flintlock revolver in 1818. Some sources say Colt saw the Collier revolver in London, and improved on it by inventing the percussion cap his Patterson revolver used. Actually, there were other guns before Colt's revolver that used percussion caps. Other differences between the Colt Patterson and Colliers flintlock revolver include: with the Colt, pulling back the hammer rotated the cylinder and locked it in place, thus creating the "single action" revolver, a single action (pulling back the hammer) did two operations; the Colt trigger folds into the handle; the Colt has a built in loading ram, that can't be lost in the field. The biggest improvement was to get rid of the flint. Flints were notoriously unreliable, and had to be changed often. If you watch a reenactment of a Revolutionary battle, you will see a lot of soldiers stopping to replace their flints. I would agree with Mr. Winterburn. He very knowledgable in this field. Isn't it possible Colt was actually inspired by other designs and made up the ship's wheel story to avoid troubles with, i.e. paying or otherwise crediting, other inventors?